Jeanne Yardley - Artist and Potter - Hand Built Works in Stoneware and Earthenware Clay. Jeanne works in ceramics, creating still life sculptures that celebrate the cultural narratives in everyday objects. Handbuilding with stoneware and earthenware, she represents scale and detail in ways that reveal the stories and memories embedded in the ordinary. 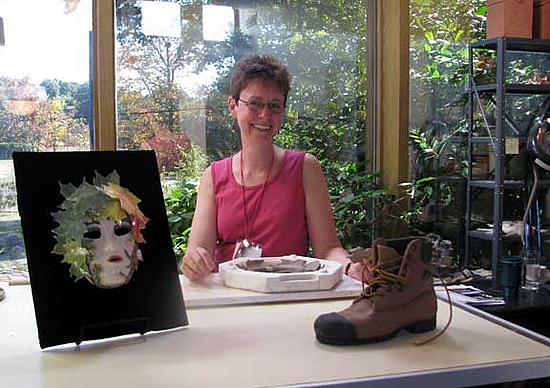 After years of collecting pottery and dabbling in clay modeling, Jeanne got her start in ceramics at the turn of the millennium, in a pottery class she organized for homeschooling families at Cambridge Centre for the Arts. Since then, she has taken courses and workshops at Mohawk College (Brantford) and Dundas Valley School of Art, as well as through the Brantford and Hamilton Potters’ Guilds. Like the legendary Halcyon bird, who nests in a spot of calm amidst the stormy sea, Jeanne finds that working with clay provides her a quiet mental space, much needed in a complex life that includes parenting two young adults, helping to run a family-owned business, volunteering in the community, and continuously life-learning about art, health, nutrition, religion, spirituality, and life in general. In March 2011, Jeanne was part of a four-woman exhibition at the Cambridge Centre for the Arts marking the 100th anniversary of International Woman’s Day. Her art has been selected for juried shows at the Cambridge Centre for the Arts (winning an Honorable Mention in 2012), You Me Gallery in Hamilton, and Waterloo Community Arts Centre (where she won 3rd place in 2011). It also regularly appears in Gallery M (Cambridge), the Cambridge Studio Tour, sales of both Hamilton and Brantford Potters’ Guilds, Cambridge Centre for the Arts Gift Shop, and Juniper Island Art Festival.